VisiVite® AREDS 2 Blue Formula is the world's only AREDS 2 made without Vitamin E, for people who take anticoagulation therapy. Highly concentrated Anti-Oxidant Vitamins, Zinc, and Bilberry. 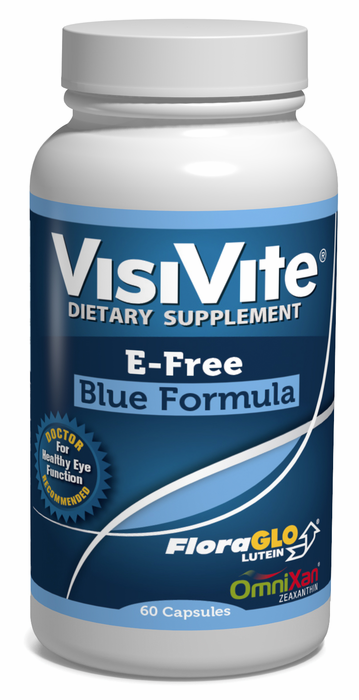 VisiVite E-Free Blue Formula is the most powerful macular degeneration supplement available for patients that prefer to avoid high doses of Vitamin E either because of anticoagulation therapy or other reasons. It contains no Beta-carotene and is therefore safe for smokers and former smokers. Requires only two per day. Dietary supplements are required by law to list the following disclaimer: This statement has not been evaluated by the Food and Drug Administration. This product is not intended to diagnose, treat, cure or prevent any disease. The world's only AREDS2 made without Vitamin E, for people who take Coumadin (warfarin). 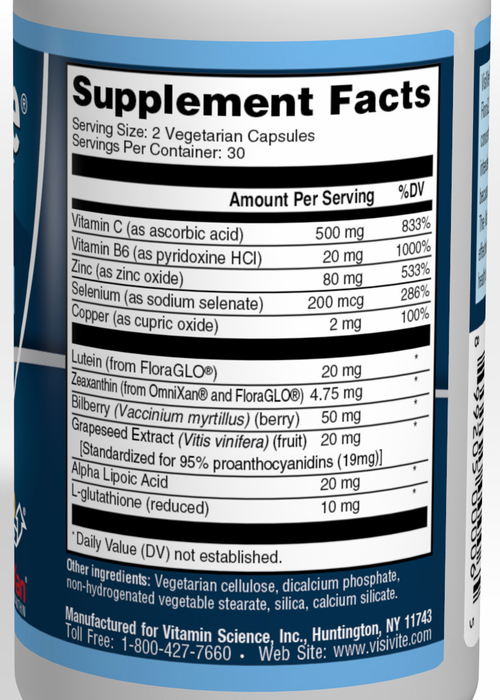 Natural lutein and zeaxanthin, clear vegetarian capsules. Directions: Take one capsule twice daily with food. 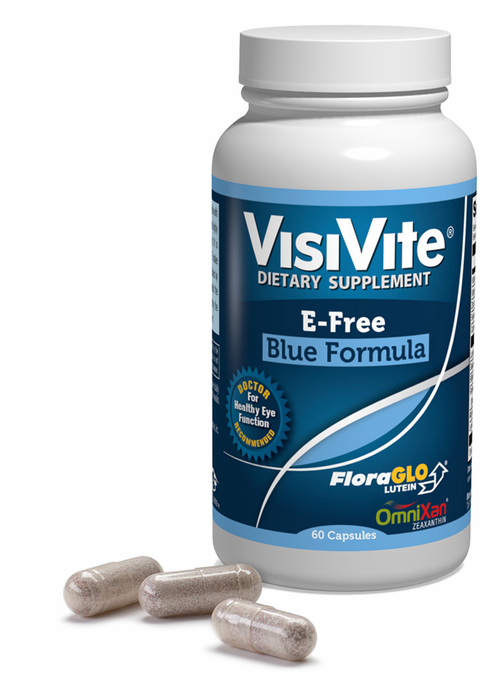 I am an 88 year old average man with diminishing sight and hearing, and I wish to tell you about my experience with VISIVITE E-Free Blue Formula. A few days ago I visited a local ophthalmologist to have my eyes tested for a new prescription. The last time I had an eye exam was about a year ago, when I was told that new lenses were probably unnecessary, as my old lenses were not much different than those prescribed. So it seems somewhat unnecessary for me to have my eyes examined within so short a period of time. My visit to the ophthalmologist was actually precipitated because I was having trouble with my current pair of glasses, which were often causing me problems with the lens popping out. Also, I didn't remember how expensive the exam was, and especially how expensive a new pair of glasses would be. Having said all that, I get to the reason for this letter. During the recent past, I have been taking VISIVITE, as explained above. After the eye examination, my doctor spoke of the VISIVITE I was taking (I had furnished him a list of prescription and OTC medicine I was taking regularly), except he used "doctor terms" in mentioning VISIVITE. He said my eyes had actually improved since my last visit! The only explanation for this phenomenon is my use of VISIVITE. I take several OTC medicines, but this is the only one with which measurable results have been attained, although I have reasons to believe that some, or perhaps all, of my OTC medicines have proven to be effective, including my blood pressure medicines, which apparently have resulted in a reduction of the dosage of prescription medicine. I was on the phone just now, and I ordered 6 more bottles of VISIVITE E-FREE, which I expect to receive within a few days. I have taken for probably 20 years......or more! We have a very unusual strain of dry macular degeneration....affecting perhaps every 1 out of 4 people on my mother's side of the family. My son at 39 was diagnosed, sadly, with this disease 2 years ago. I am in my 70's and though my vision has decreased....it stayed stabilized for 20 or more years. I attribute it to this vitamin. My son is taking the Gold version while I am on VisiVite E-Free because of taking a blood thinner. I recommend it! Merchant Response:That's great news, Ray. VisiVite AREDS 2 E-Free Blue Formula is the only AREDS 2 made specifically for people on warfarin (Coumadin) and other blood thinners. Sir, I have dry AMD in my left eye and wet AMD in my right eye. Have been getting intraocular injections of Eyelea in both eyes for about 4 years. No improvement but seemed almost stable. Heard from a friend that he tried AREDS2 and seemed to improve. I decided to try it and after three bottles I think the black dark spot -dry AMD in left eye- is really faint and the black spot in the wet MD in the right eye has changed to a pale grayish dark spot. I am also trying other things but I think the change has occurred using VisiVite. I have macular degeneration worse in my right eye, but my heart specialist told me I couldn't take Vitamin E because I was on warfarin. 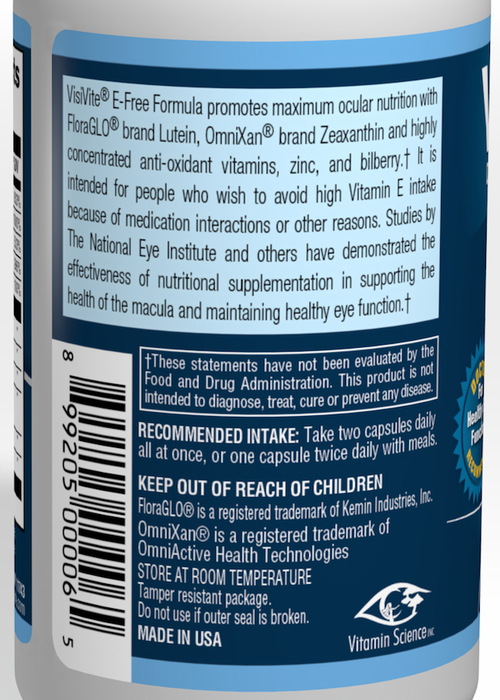 I finally found this vitamin for my eyes without vitamin e. Very happy with quality of ingredients too. Only E free I can find.